The Beauty Scoop! : Yves Saint Laurent Autumn 2011 - YSL 5 Ombres Lumiéres, 11, Midnight Garden Eyeshadow! 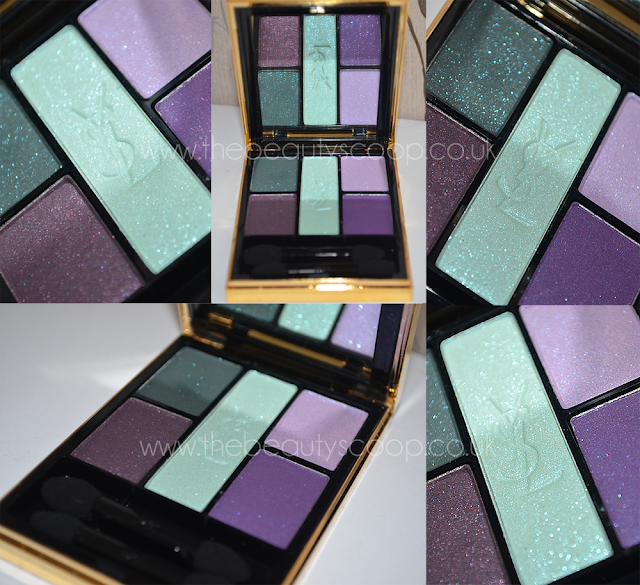 Yves Saint Laurent Autumn 2011 - YSL 5 Ombres Lumiéres, 11, Midnight Garden Eyeshadow! By now, you may already know of my love for Yves Saint Laurent make-up (and basically every other luxury beauty brand too, for I am a girl with expensive taste and a big beauty shopping addiction, but the less said about that in black and white the better as I never know if Mr Beauty Scoop sees any of these posts), so when I got sent some of the new autumn collection to try, I was very excited indeed. First up from the collection is quite possibly my favourite from the collection, the Ombres 5 Lumiéres in 11, Midnight Garden. 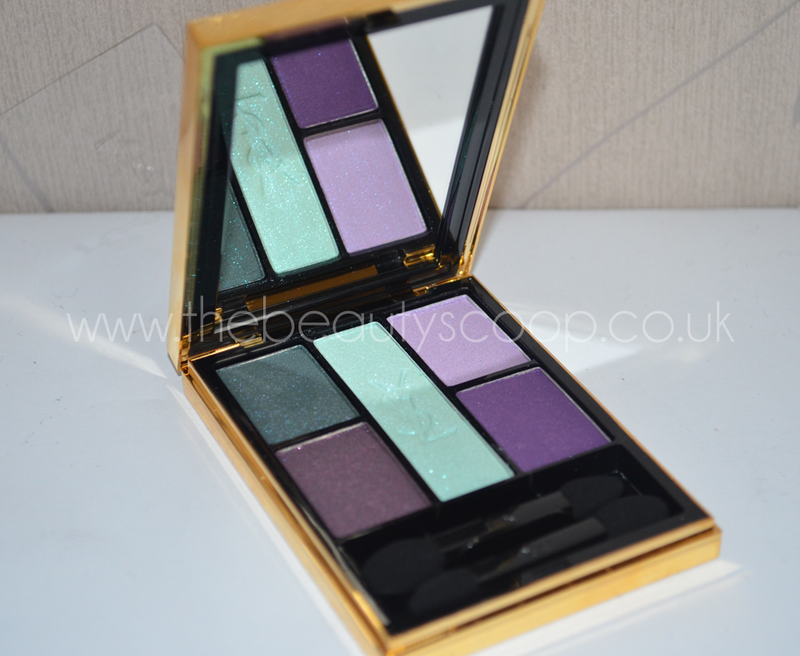 This palette is made up of shades of purple and green that are very pretty to look at in the pan, and yes, I did find myself making it twinkle in the light before swatching them. Which brings me to my next point, that is if you don’t like shimmer or glitter, then this palette is not for you at all as it is loaded with shimmery and glittery particles galore... but this makes the magpie in me very happy indeed! Back to the colours though, I really like the selection in this compact and I think that they work together surprisingly well. 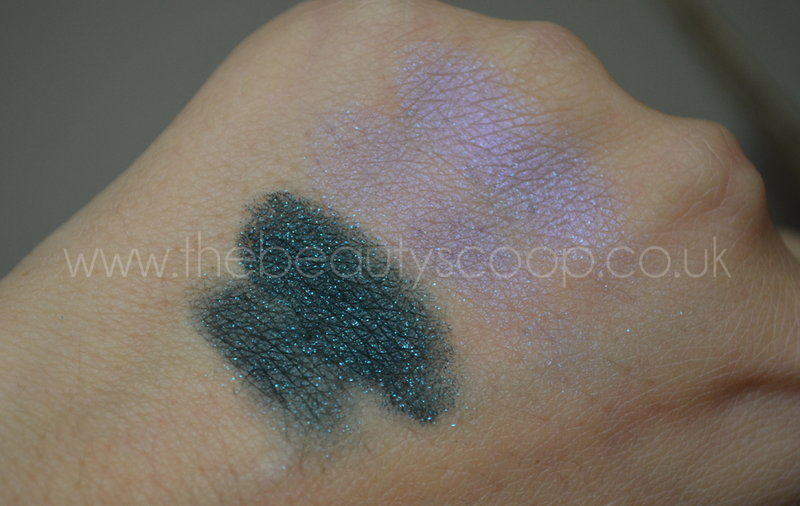 There’s a deep, forest green with teal shimmer running through it that I cannot, for the life of me get my camera to catch – it is stunning though and a very pale mint green with teal shimmer running through – although I think this is touted more as a highlighter than a shadow, but it is pigmented and colourful enough to use as a shadow too, in my opinion. 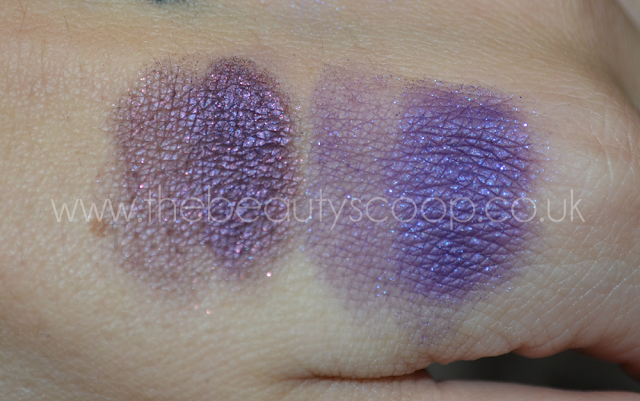 There’s also a lilac in there that looks to have sky blue shimmer running through it, a more aubergine-y (eggplant) shade of purple with what looks like a very fine red/magenta shimmer and an almost electric purple with blue shimmer running through it. 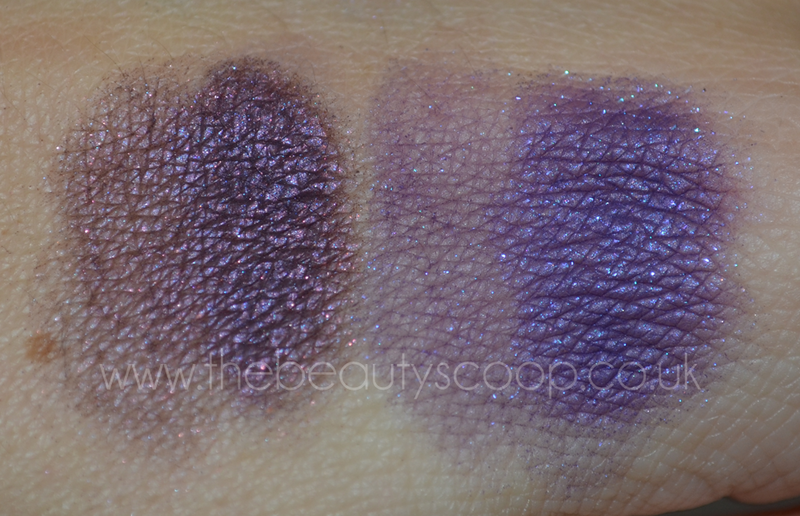 The contrasting shimmer running through these shadows, really make them pop, it gives them more depth and a multi-faceted appearance too!The lighter shades are almost iridescent in some lights too - totally stunning! 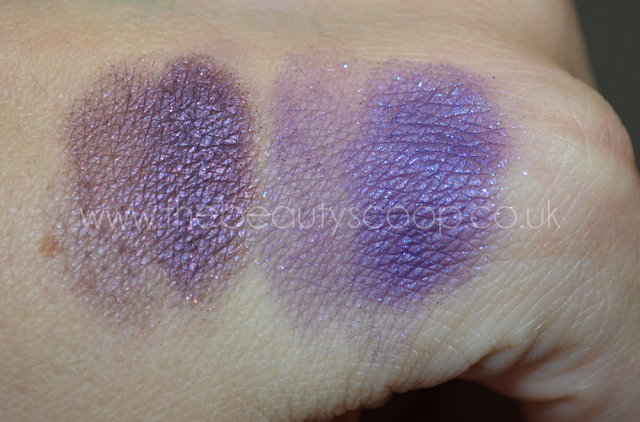 The darker shades in this compact are a LOT more pigmented than the lighter ones (especially the lilac), but can still be used as a light wash of colour if you wanted as they are still very buildable when used dry/alone... they all apply a lot better over Urban Decay’s Primer Potion though, as you can see on the swatches – which is how I’d use them anyway, personally. 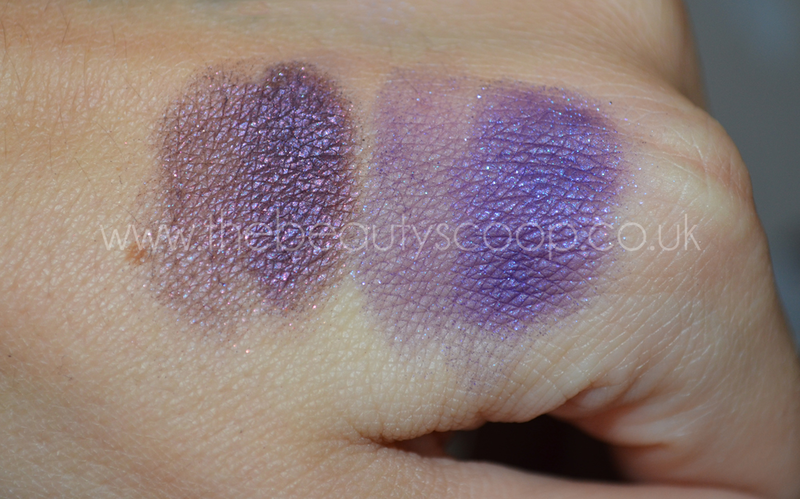 The swatches were done using the sponge applicators included in the compact, on the left is a dry swatch and on the right is applied over UDPP - which makes a huge difference in depth with less effort needed! However, I quite like that you can use the colours a bit more subtley if you desire, it makes this palette much more universally wearable! Showing the highlighter blended out, I thought it looked quite nice. 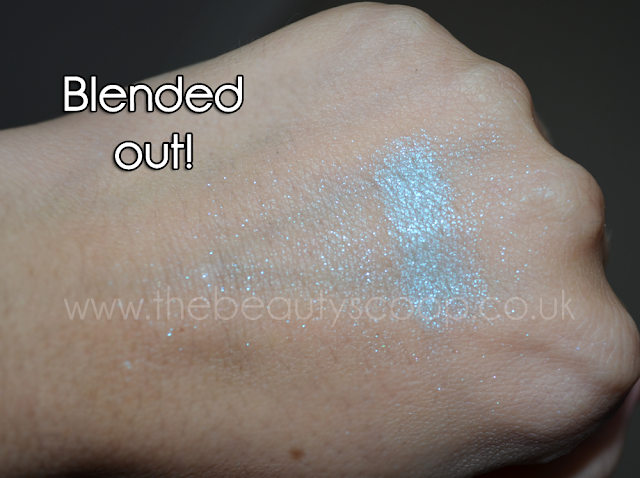 The lighter shades are still lovely, but just need a bit more time spent applying to get the desired effect, I find this is the case a lot of the time with lighter shades so it’s not really of too much detriment to the palette... and it also allows you to use both as a highlighter, due to them not being too heavy in application. All the shadows had great staying power on my lids too – even the lighter ones, I was very impressed... although not quite so impressed when I was trying to remove them from my hand after swatching, ha! The packaging is gorgeous, as always – but also as always, is a total fingerprint magnet and I do find myself buffing these cases quite a lot to try to hide that, is that a bit OCD? Anyway moving swiftly away from my OCD tendencies, I really recommend this palette to those of you like me that have magpie tendencies and a penchant for colour. 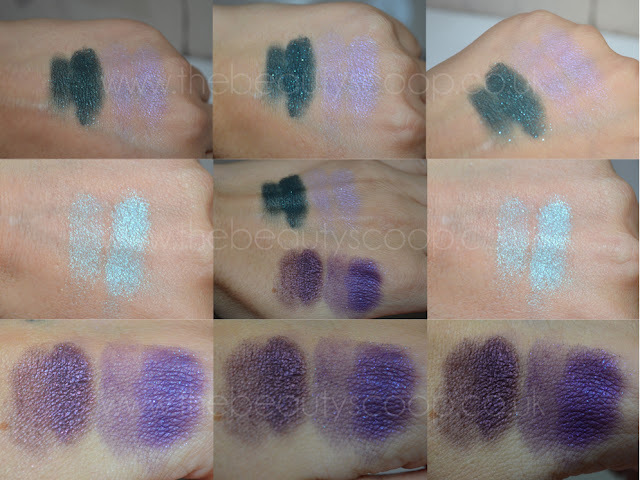 It is £40, but then you get 5 products in there totalling 8.5g... which effectively makes each shadow £8. I really don’t think that this all that bad to be honest, especially if you consider that a No7 Stay Perfect Eyeshadow will set you back £8 for 1.5g of product - which, if multiplied by 5 would equal 7.5g... which is 1 whole gram LESS than YSL give, therefore making YSL surprisingly better value, financially, than No7!! Not sold on your No7 comparison, really...everyone knows that they have those £5 vouchers so regularly that it's kind of rare of people, beauty bloggers especially, to actually pay full price for a makeup product. So I can't really agree with your assertion that it's better value to buy the Yves Saint Laurent. Maybe if you'd compared it with a different brand? 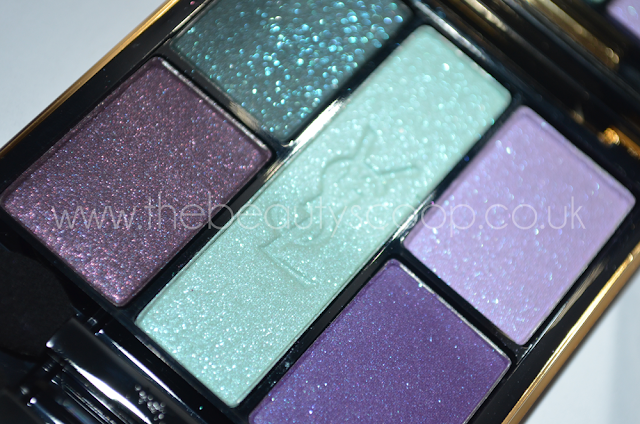 This palette is to die for! Not keen on the light blue but the forest green is breathtaking! I'm loving all of these colours. Holy moley! These are all gorgeous, I wish I wore eyeshadow more! The Botox Diaries & Re-Ehnance Clinic in Hale! Celeb Sunday - Gwyneth Paltrow! 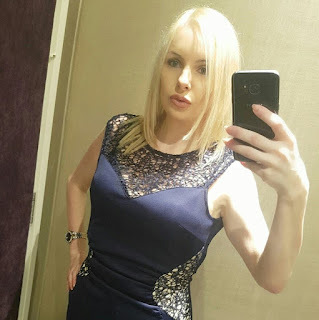 Titanic Spa & Our Girl's Night In! 'Wordless' Wednesday - Diane Kruger! Nicki Minaj Exclusive Polish Collection For OPI! Celeb Sunday - Cher Lloyd! Eyeko Rebranding & Price Hike! 'Wordless' Wednesday - Dannii Minogue! Selfridges Beauty Advent Calendar 2011! 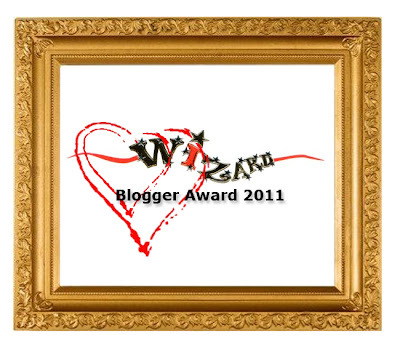 Be Fur Free with Ministry of Waxing & PETA! Wordless Wednesday - Pixie Geldoff! Celeb Sunday - Cheryl Cole! The World's Most Expensive Blow Dry?! My Gripe With Dettol No-Touch Hand Wash System! Wordless Wednesday - Jodie Marsh! Good Things Ultra Rich Range! Celeb Sunday - Kimberly Wyatt!